The bay tree is a popular evergreen shrub suitable for containers or growing in the ground. Kept neatly clipped, the dark-green foliage can create stunning formal shapes that make an entrance or look perfect on a patio. Bay leaves can be used fresh or dried and are used in cooking to give a fragrant flavour to soups, stews and other dishes. Bay can be grown in a number of ways. It thrives in containers, especially if watered regularly and positioned in a sheltered spot. In the garden, bay trees grow as a large bushy shrub or small tree, reaching a height of 7.5m (23ft) or more. Bay can also be turned into topiary (trees or shrubs cut or trained into specified shapes) specimens which can be shaped into pyramid, ball or "lollipop" standards, and some have ornately plaited or spirally trained stems. Pruning and training depends on whether you have trained the bay as a topiary or are simply growing it as a shrub in the ground. Leaf spots - often caused by waterlogged roots, or wet weather conditions. Plants in containers are also very prone to this, usually indicating that the compost has become old and tired. 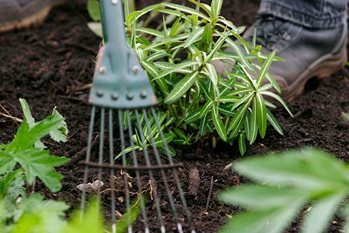 Repot your plant in spring into fresh, well-drained compost. Yellow leaves - older leaves will shed naturally in low numbers. Nutrient deficiency can be the problem in container-grown plants but is more commonly caused by waterlogged compost or cold weather damage. Peeling bark - following the recent harsh winters many bay trees developed cracking and peeling bark, especially on the lower main stems. The cause is uncertain, but the winter cold, and possibly other stress factors such as fluctuating soil moisture levels are likely to be involved. Though the damage looks alarming it does not appear to be invariably fatal. If the rest of the plant is growing normally or recovering from winter damage (recovery should be apparent by midsummer if it is to happen) no action is needed. However, if the growth above the damaged area is dead, remove the dead parts cutting to healthy wood (i.e. green under the bark) or to near soil level. Recovery from lower down or soil level often occurs. Other problems - brown leaves and insect infestations from bay sucker, soft and horse chestnut scale. Bay is relatively resistant to rabbits, being nibbled less than many plants.